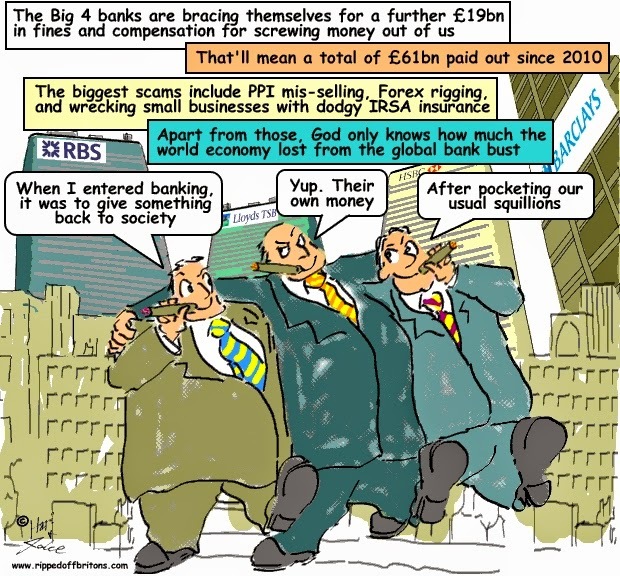 Bank scam fines to pass £60bn. That's not including the cost of global collapse, of course! The UK’s ‘big four’ banks – HSBC, Barclays, Lloyds Banking Group and Royal Bank of Scotland – have already racked up a £42billion bill in the UK over the last five years. This represents 88 per cent of the industry wide total of £48billion in charges faced by 13 banks and building societies in Britain. S&P said it now expects the UK’s four biggest lenders to face further penalties in 2015 and 2016 of £19billion – taking the total for the big four to £61billion. The bill has been driven by the mis-selling of payment protection insurance (PPI) as well as interest rate hedging products to small and medium-sized businesses. ‘We think that conduct and litigation charges are now a way of life for the UK banking industry,’ said S&P in the report. Screwing small businesses and the public sounds like a dry run to test the opportunities for TTIP. God help us all if Tories get to run with that. The information on this site is valuable. However, it is presented in a way that makes it very difficult to read. Please simplify the layout and dump the clever web design. Thanks.